I love the Nashville Farmer's Market. As anyone who's been there knows, it's much more than simply a farmer's market. It's also a flea market (on the weekends). And it's adjacent to the Bicentennial Mall, which is The Smallest State Park In Tennessee. And right in the middle of the farmer's market is a food court, with both restaurants and food shops hawking the ethnic and the bizarre. It all opened in 1996 (the bicenTENNial) and since has provided many hours of amusement and cheap dates. When I was a courier, I ate lunch at the food court on a pretty regular basis, because it's always had such an interesting variety of things to eat. Parco Cafe used to be in the Farmer's Market, and in my opinion, it's never been quite the same since it moved to Printer's Alley. There is a Swett's. There is a Jamaican place. There is a Chinese place. There used to be a great hot dog stand that served a hot dog with hot chow-chow on it that was out of this world. Anyway, as great as the Farmer's Market has been, no one's ever accused it of being too crowded or too popular. But now there's a movement to change that and raise the profile. They've got themselves a website. And they're renovating the whole place. 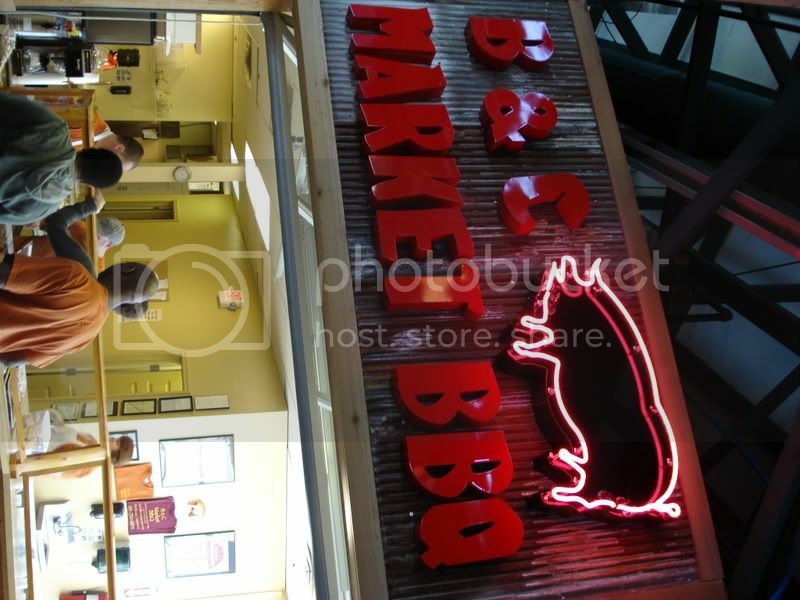 With those renovations have come new tenants, and one of those new tenants is B&C Market BBQ. The "B&C" stands for "Bacon & Caviar," which is the name of the catering company which spawned the barbecue restaurant. While barbecue has been a part of the three year old catering company's offerings, owners Ed Smith and Paul Johnson recently decided to make it more of a focus and open the restaurant. The restaurant is a little different than most in the food court in that it's not a booth or a counter - you can actually step inside. The simple menu is written on a blackboard on the wall. On the day I visited, they had pulled pork and pulled chicken. Normally, they also have smoked salmon (!) and pork ribs. Sides are the usual BBQ joint suspects - baked beans, cole slaw, potato salad, mac-and-cheese - plus corn pudding and a chipotle corn salad. 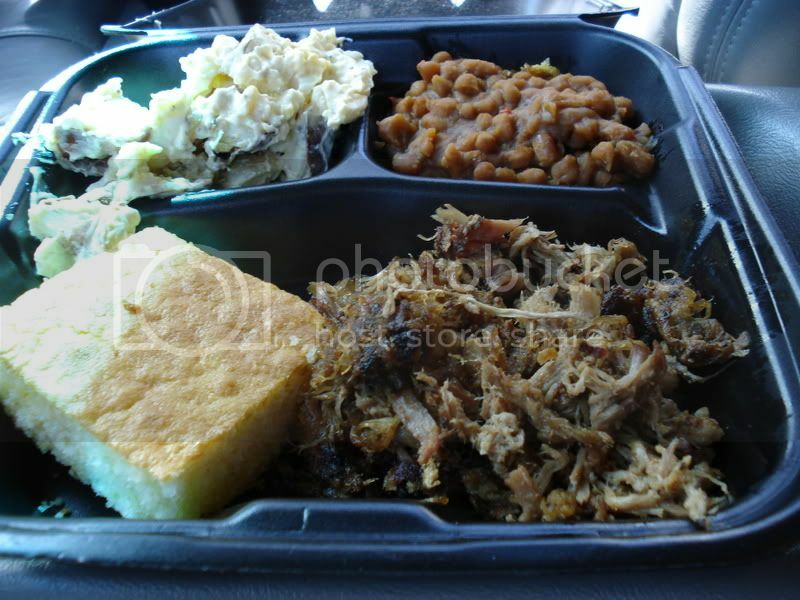 I went for a pulled pork plate with baked beans and potato salad. One of the results of being a member of Team Ulika is that I have developed exceptionally high standards for pulled pork. So believe me when I tell you that B&C's pulled pork was very, very good. It was seasoned just right, resulting in exceptional flavor, especially in the plentiful bark pieces. It could have been just a bit more moist, but I think it may have suffered from being on a serving tray for too long. It came sans sauce, and really didn't need any, but I tried some anyway. It was an excellent sauce, definitely more interesting than the "slightly enhanced ketchup" which passes for barbecue sauce so often in this area. The mild version which I tried had quite a kick to it, and reminded me a lot of Gate's sauce with its unique chili flavor. The sides were somewhat less impressive, but still not bad. The baked beans came off as kind of bland on first taste, though there was an interesting spicy-sweet flavor buried in the mix. Perhaps that flavor could be turned up? The potato salad, which B&C calls "baked potato salad" again showed potential. The potatoes were cooked perfectly, not too firm and not too mushy. But the flavor was a bit too mayonnaise-heavy. Just a dabbling of complementary flavors could take it from good to great. Also, I want to say just a few words about the cornbread. It's definitely more of a corn light bread, but even that doesn't accurately describe it. It was definitely sweet, but it was not crumbly at all. In fact, it was closer to the texture of angel food cake - very interesting, and, might I say, a very refreshing alternative. The potential is there for this to be a successful restaurant. If they can consistently turn out a product that is as good as what I tasted, they will have a shot. What remains to be seen is whether the Farmer's Market location will be a benefit or a bane. Nice post. You and Rob definitely have me interested in finding out more about corn pudding. Kansas City offers nothing like this. Good pics too! Ben, your locution is unmatched. Epicurean journalism may be your true calling.